Madison Chock and Evan Bates perform their Free Dance at the 2015 U.S. Figure Skating Championships. 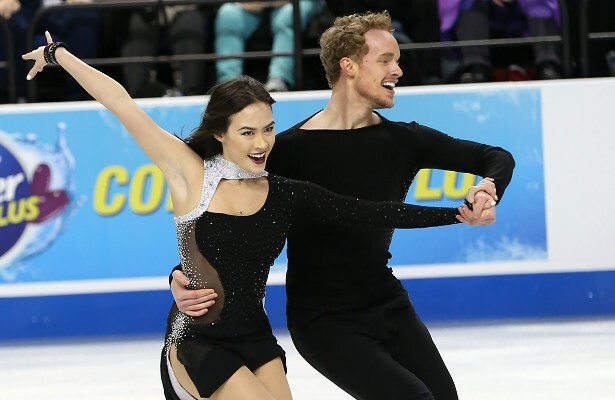 After winning silver at their two previous national championships, Madison Chock and Evan Bates took their first senior national title at the 2015 U.S. Figure Skating Championships in Greensboro, N.C. When asked how they felt about starting a new “legacy” becoming the new U.S. champions after Meryl Davis and Charlie White’s six-year run, Bates was quick to quell that term. Coming into the season, the team felt their training had went very well. Their goals for this new quad cycle is to just take it one year at a time, however, the 2018 Olympics are definitely in their sights. The ice dancers, who are coached by Igor Shpilband, kicked off their international season earlier this fall at 2014 Nebelhorn Trophy where they finished second. They later took gold at both their Grand Prix events at Skate America and Rostelecom Cup, concluding with a silver at the Grand Prix Final (GPF) in Barcelona, Spain. At nationals, Chock and Bates danced a flawless routine in which all their brilliantly choreographed elements hit the high points of the music with exceptionally good timing. They also earned a level four on both their straight line lift and twizzles, and placed first with 73.95 points. Their partial step sequence, which has been reworked since Barcelona, met two of the three key points with mostly +2 grades of execution (GOE). The 2013 Four Continents bronze medalists performed a jazzy, flirtatious routine in their modern interpretation to music from An American in Paris. They skated with good speed and showed innovative lifts and an interesting retrograde footwork sequence to score 111.11 points for first place and overall (185.06). The team, which received no less than +2s and +3s on their GOEs across the board, also earned a level four on all three lifts, the twizzles, and combination spin. It’s really exciting to have done that at the U.S. Championships, and we’re just excited to go forward and on from here,” said Chock. The 2014-15 GPF silver medalists have had a relatively short journey to their title as they only teamed up in July 2011. Many did not feel that the partnership would not be suitable due to their different styles and the one foot height difference. Despite their short time together, it is obvious that the team has grown. Both skaters had previous partners. Bates competed with Emily Samuelson for 11 years before they called it quits, while Chock was with Greg Zuerlein for five. Chock and Bates will compete next at the Four Continents Figure Skating Championships alongside teammates Kaitlin Hawayek/Jean-Luc Baker and Maia Shibutani/Alex Shibutani. They will also compete at the World Figure Skating Championships later in March.